McBride High School and the California Academy of Mathematics and Science have earned key certifications for providing students specialized academic and career pathways. The certifications by independent reviewers affirm the high quality of college and career preparation programs at these schools. McBride earned Linked Learning Gold pathway certifications for its Engineering pathway and its Criminal Justice and Investigations pathway. 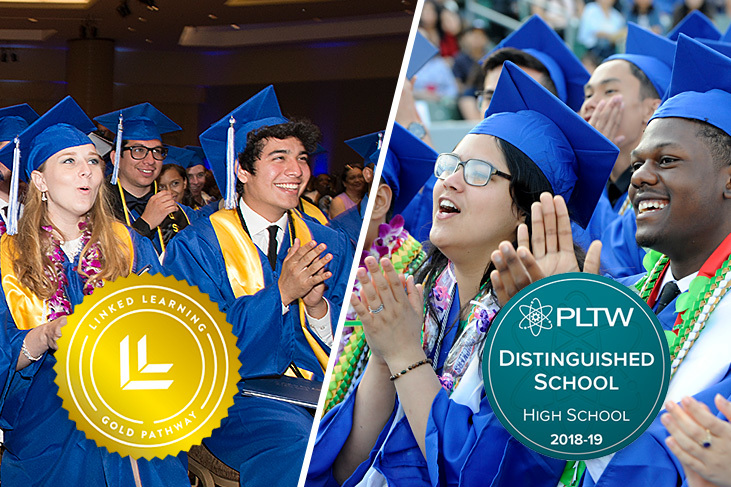 Meanwhile CAMS earned the Project Lead the Way Distinguished School honor for providing students “broad access to transformative learning opportunities” in computer science, biomedical science and engineering. CAMS is one of only 64 high schools across the nation to receive that award. • Have 70 percent of students or more earn a proficient score or higher on PLTW end-of-course assessments, or 10 percent of students earn the Advanced Placement + PLTW Student Achievement, which offers a pathway providing both types of classes. McBride is one of the first schools to earn the Gold Certification after participating in a pilot effort. Linked Learning pathways combine challenging academics, demanding technical courses, and work-based learning focused on an industry theme. “We deeply appreciate all of your hard work and are grateful for the inspiration and example you have set for others who are working to implement high-quality Linked Learning pathways,” said Anne B. Stanton, president of the Linked Learning Alliance. The alliance is a statewide coalition of education, industry and community organizations dedicated to improving California's high schools and preparing students for success in college, career and life. CELEBRATED SCHOOLS – Students from McBride High School and the California Academy of Mathematics and Science participate in commencement ceremonies.